Do you have in debt passion for Love gistz, Fashion stories, Sports mataz, Politics palava, Latest gossips, Campus stories, Conducting Interviews, VJ and everything that deals with journalism? Are you ready to learn blogging, be one of our online bloggers and news correspondent? Are you ready to be one of our column writers and have your write-up published on our site, other online media network and various print media? Are you ready to explore your God given talents and make a living out of them? Are you burning with the desire to be heard,seen and be a source of motivation to millions of young people in this country and in our great citadel of learning? Are you ready to read, learn and earn being a student in UNIZIK? 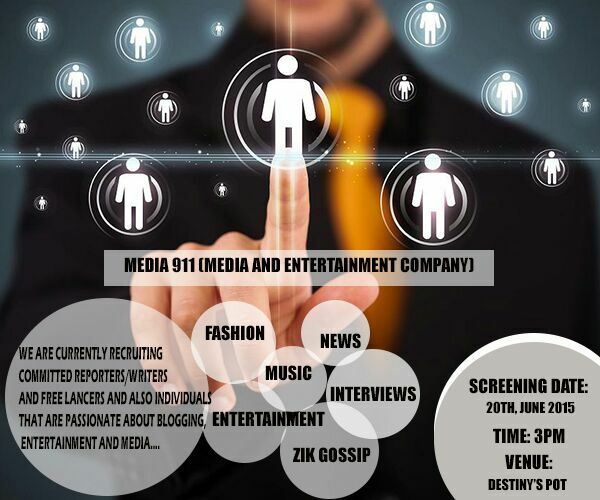 Then its time you came on board and be part of The Media 911 Crew (Unizik Mata Team). SCREENING DATE: Saturday 20th June, 2015. VENUE: Destiny’s Pot Eatery Perm site, opposite school gate Ifite Unizik. Its once in a life time…Grab this ample opportunity NOW!!! Wow..so we can finally be part of the crew..I love your work.. I don join be that nah.. Please is there any criteria for joining the crew?. Is it for everyone or only masscom students?